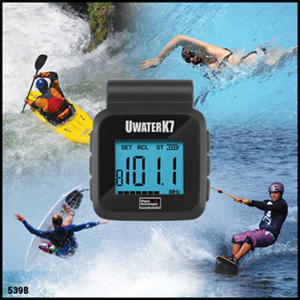 "World's Smallest Swim Radio Player"
End the boredom of lap swimming or just enjoy hearing music, talk, sports, news, in the water, on the beach, while walking, jogging, exercising, showering, sauna, any activity! Take advantage of this amazing promotion and try the K7. You'll never swim without it again! This latest generation patented micro-sized entertainer clips securely onto headband, armband, bathing suit or goggles for swim-anywhere, go-anywhere, sweat-anywhere, listening pleasure. Unique IPX8 case and 3D controls are 100% Waterproof. 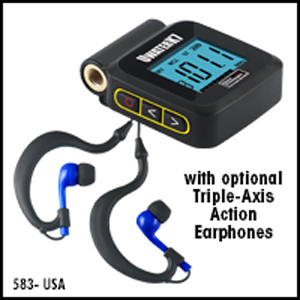 Lightweight, ergonomically-designed extra-soft silicon Ear-Tips (4 sets) seal water out and keep pure stereo sound in. State-of-the-art micro circuitry technology provides clear reception indoor & outdoor worldwide. Continuous operational time 6 to 8 hours on a single charge of its built-in high performance (1000+ cycle) Lithium-Ion rechargeable battery. Our 100% waterproof single port 3.5 mm earphones/USB connection completely blocks water/sweat out and provides crucial long term protection against corrosion in treated and salt water - a problem which always damages regular devices. We also installed a large 1 Inch easy-to-read LCD for clear visual communication in any water environment, plus 19-station presets with simple setting and recall functions. 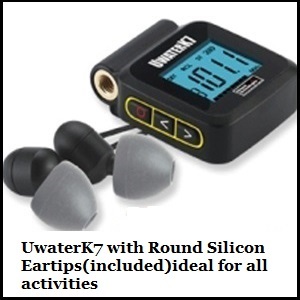 The UwaterK7 is also ideal for water aerobics, aquatic therapy and sauna. 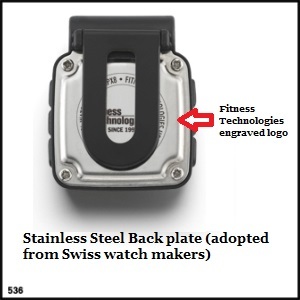 Fitness Technologies, Inc. has been the USA#1 provider of waterproof electronics since 1996. Our Waterproof Audio Technologies (WAT) were featured in the New York Times, LA Times, Men's Health (Europe), Swim World, Fitness Swimmer, Triathlete Magazine, CNET, as well as over 30 other publications (see "Uwater in the media"). Also endorsed by the US National Sporting Goods Association. Designed in the USA. Patented. Beware of cheap imitations. They won't last beyond your first lap. Since 1996 our engineers have invested years of R&D on improving Waterproof Audio Technologies (WAT), optimizing in-the-water audio reception, tuning and controls. 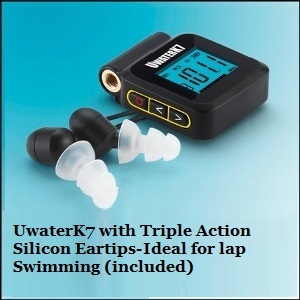 Make sure that your waterproof MP3 is one of our trademarked brands-UwaterK8, UwaterT3, UwaterG2, UwaterG4, UwaterG5X, and UWaterK7, from Fitness Technologies, Inc.